In a major boost for Indian fire power, India and Russia have signed an agreement for producing the 80 km-range Smerch rockets at ordnance factories. “Ordnance Factory Board (OFB) signed an MoU for a joint venture with Russian Rosoboronexport and Splav ‘Spa’ to manufacture five versions of Smerch rockets based on the transfer of technology from Russia. More than two regiments of the Smerch rockets have been in service in the Army after their induction about six years ago. 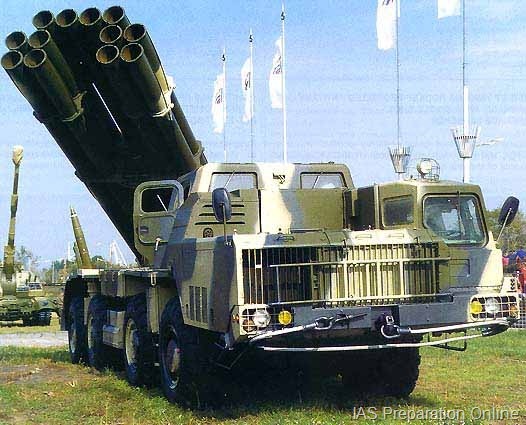 “Smerch rockets are technologically superior having a range of 70-80 kms. After indigenising the technology of Smerch rockets, OFB will attain new heights in manufacturing of advanced rocket system. The two sides have been discussing the local production of Smerch missiles for a long time now and it is believed that OFB, Ambajhari will be the manufacturing agency. OFB Ambajhari is also involved in manufacturing a major chunk of the rockets of the Pinaka Multi-barrel Rocket Launchers (MBRLs). OFB is also working on local production of 155mm 39 calibre Bofors artillery howitzers.